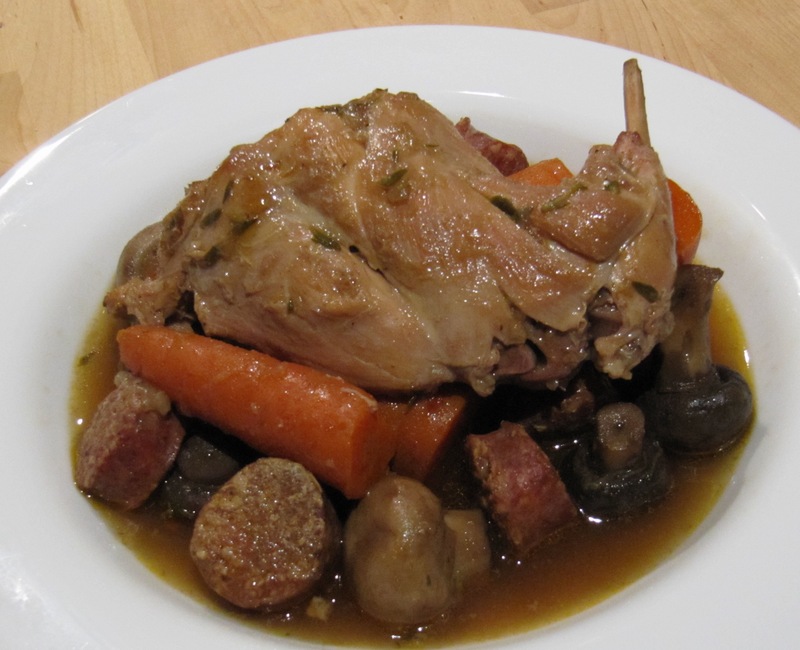 This is a very easy slow cooker recipe that produces very tender and succulent rabbit. The flavor of the andouille sausage is a great feature in this otherwise very basic stew recipe. Remove legs from rabbit. Heat oil in a large pan and brown rabbit on all sides over medium-high heat. Remove rabbit and add onion, sausage, and spices to same pan. Add 1/4 cup of the stock to deglaze the pan. Cook for a couple minutes until onions are transparent. Place mixture in slow cooker with rabbit and remaining ingredients and cook on high for 6 hours. This entry was posted on Friday, January 21st, 2011 at 8:15 pm	and tagged with andouille, crock pot, paleo, primal, rabbit, recipe, slow cooker, stew and posted in Food. You can follow any responses to this entry through the RSS 2.0 feed.